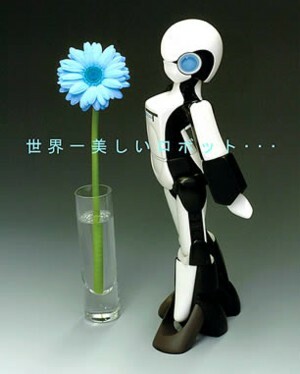 On April 7, Robo Garage, a venture company of Kyoto University, unveiled a slender and agile biped female robot. Named FT (short for "Female Type"), the robot has a plastic and carbon fiber body, weighs 800 grams (1.8 lbs. ), and stands 35 centimeters (13 inches) tall. Her 23 joints enable her to perform a range of fashion model type moves, like arching her back and swinging her hips as she walks, as well as runway-style turns. FT's components were designed and arranged to create a feminine body line. Robo Garage, who spent about one year working to realize its dream of creating a feminine robot, has not yet determined whether FT will be made commercially available. "In developing FT, we also sought the advice of pro models," says Tomotaka Takahashi, head of Robo Garage. "I hope that by evoking a sense of familiarity and comfort, FT can expand the potential of robots." Well, the overall shape is accurate. But I won't be satisfied until Fembots reach the level in GitS2 (w/o the killing and all though). J/K. Very interesting. Im glad that someone made a girl robot. Im just sick of all the boy robots this boy robots that. Do you get what I mean? So all Im saying is that boys arnt the only creature on Earth. Girls are here. AND GIRS RULE!